The theme is currently available on iTunes, with a full soundtrack planned for this summer. 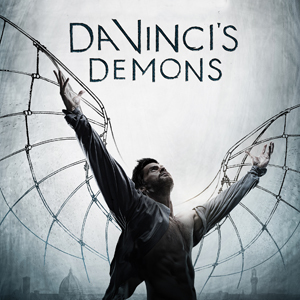 For the historical drama DA VINCI'S DEMONS (airing on STARZ), composer Bear McCreary was inspired by Leonardo Da Vinci, who famously wrote backwards and forwards. Said McCreary, "Leonardo’s Theme is a palindrome, inspired by the mirror writing (writing backwards and forwards) that he is famous for. In music, this technique is an established trick called ‘retrograde.’ The theme is the same when played forwards or backwards." (April 11, 2013 – Culver City, CA) Composer Bear McCreary announces the launch of Sparks & Shadows, a new boutique record label that will release soundtracks primarily composed by the Emmy-nominated composer. The first four releases from the label will include two albums for Defiance (the Trion Worlds videogame and the SyFy television series), Da Vinci’s Demons (STARZ, BBC) and the upcoming feature Europa Report (Magnet). McCreary, listed by Io9 as one of the ten most influential science fiction composers in history, was recently named a “Secret Weapon” by WIRED Magazine.